Caretaker manager Gary Teale knows St Mirren must build on the spirit shown in their 3-1 win at Dundee if they are to survive in the Premiership. "The boys were great against Celtic last week but just fell short, so it was just about keeping that belief," he told BBC Scotland. "The togetherness was there and that's what will carry us for the rest of the season. "We will never get anywhere without the whole group pulling together and then we need to win as many individual battles as we can." Kenny McLean continued in an unfamiliar striker's role and turned in a great performance scoring goals either side of a wonderful strike from Stevie Mallan to lift the Buddies one point ahead of bottom club Ross County. "I don't think Kenny had ever played up front before last week but he did so well we kept him there and he was superb," explained Teale. "He held the ball in and linked play. He has great ability and could easily do a job down south. It's just a question of someone taking a chance on him. "He can play anywhere on the park with the natural ability he's got and he has a top drawer attitude." 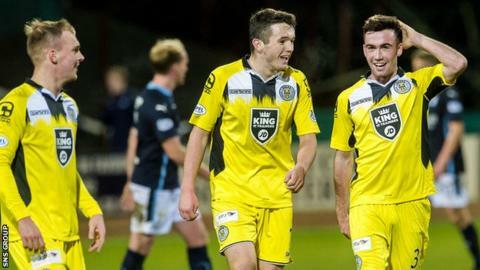 St Mirren had gone 10 matches without a win before the trip to Dens Park and Teale is keen on staying in the post permanently. "I was delighted with the patience we showed on the ball and the chances we created, although we rode our luck at times too," he added. "Dundee threw a lot at us but over the piece we deserved to win the game. "I'm here because results weren't good enough, so I know if we don't get the results we need someone else will come in. "It's up to me to get the team set up playing how I want them to play and hopefully the players will buy into it." A winless run in December has been frustrating for Dundee manager Paul Hartley, who said the display was "just not good enough". He went on: "It was a really disappointing performance. We didn't pass the ball well. "I think we've been okay so far this season but we need to get better in certain areas. "We're looking at maybe bringing in another centre half and a midfielder but January is not an easy window. "We need a reaction against Dundee United on Thursday. We need a team that will go there and roll their sleeves up."